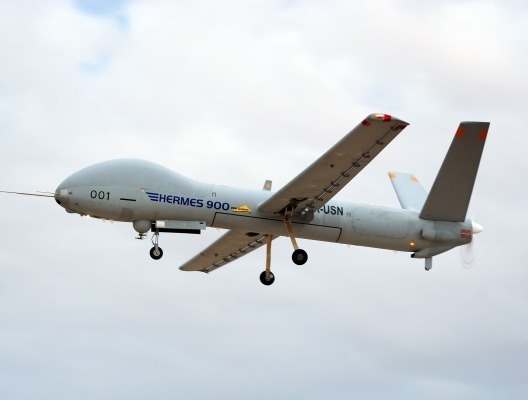 The Brazilian Air Force (FAB) has acquired a unit of the Israeli Elbit Systems Hermes 900 remotely piloted aircraft (RPA). The contract signed last week (March 19) includes logistical support and a one-year warranty of the equipment. The purchase was closed by the Air Force Logistics Center (CELOG) which has been negotiating the deal since last year. According to CELOG commander, Air Brigadier Ricardo César Mangrich, the new UAV will arrive in Brazil in early May, and will be ready for use during football the World Cup. The competition starts in June. The new aircraft will be operated by the “Horus” Squadron (1º / 12º GAV), which has been operating the FAB’s RQ-450 Hermes unmanned aircraft since 2011. Headquartered in Santa Maria (RS), the squadron has begun theoretical training courses for Hermes 900 crews. Acquiring a UAV which belongs to the same “family” as the ones already in service facilitates the service introduction process. So much so, in fact, that the crew will operate the new aircraft during takeoffs and landings from the same ground station (shelter) currently used. The acquisition is also part of the FAB’s plan for UAV acquisition. In addition to the well-known RQ-450 Hermes, among the main advantages of operating Hermes 900 is its “SkEye.” This is a set of 10 high-resolution cameras which allow surveillance of an entire region. The software which processes the set of images, allows them to be viewed independently, and so different targets can be monitored simultaneously within a given area. About 10 people will be needed to operate the new equipment. This sensor fitted to the Hermes 900 bought by Brazil was, until now, only available to the Armed Forces of Israel. Classified as a category-4 equipment, the Hermes 900 is operated using satellite communications. The link will allow the machine to fly well beyond the 250 km range of the Hermes 450. In addition, the 900 can fly at 30,000 feet (over 9000 meters high) and has an endurance of over 30 hours of flight time -- about double that of the RQ-450. These advantages are important allies in the toolset used by FAB for the electronic monitoring of borders. In the Americas, the Hermes 900 is operated by Mexico, Colombia and Chile.